Indigenous, Modern and Postcolonial Relations to Nature contributes to the young field of intercultural philosophy by introducing the perspective of critical and postcolonial thinkers who have focused on systematic racism, power relations, and the intersection of cultural identity and political struggle. Angela Roothaan discusses how initiatives to tackle environmental problems cross-nationally are often challenged by economic growth processes in postcolonial nations and further complicated by fights for land rights and self-determination of indigenous peoples. For these peoples, survival requires countering the scramble for resources and clashing with environmental organisations that aim to bring their lands under their own control. The author explores the epistemological and ontological clashes behind these problems. This volume brings more awareness of what structurally obstructs open exchange in philosophy world-wide, and shows that with respect to nature, we should first negotiate what the environment is to us humans, beyond cultural differences. It demonstrates how a globalising philosophical discourse can fully include epistemological claims of spirit ontologies, while critically investigating the exclusive claim to knowledge of modern science and philosophy. This book will be of great interest to students and scholars of environmental philosophy, cultural anthropology, intercultural philosophy and postcolonial and critical theory. 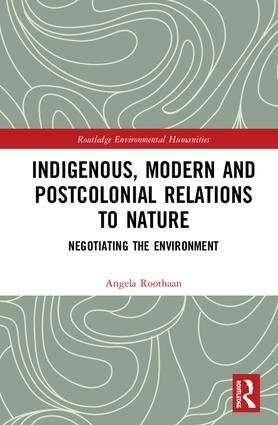 "Roothaan’s Indigenous, Modern and Postcolonial Relations to Nature takes a fresh approach to dialogue between modern Western and indigenous or traditional approaches to nature. She neither insists that non-Western environmentalisms follow Western science before dialogue can begin, nor does she turn non-Western approaches to nature into a version of Romanticism. This book will be of interest to African philosophers and other non-Western philosophers, intercultural philosophers, environmental humanists, anthropologists, postcolonial studies scholars, and many others." From microplastics in the sea to hyper-trends such as global climate change, mega-extinction, and widening social disparities and displacement, we live on a planet undergoing tremendous flux and uncertainty. At the center of this transformation is human culture, both contributing to the state of the world and responding to planetary change. The Routledge Environmental Humanities Series seeks to engage with contemporary environmental challenges through the various lenses of the humanities and to explore foundational issues in environmental justice, multicultural environmentalism, ecofeminism, environmental psychology, environmental materialities and textualities, Traditional Ecological Knowledge, environmental communication and information management, multispecies relationships, and related topics. The series is premised on the notion that the arts, humanities, and social sciences, integrated with the natural sciences, are essential to comprehensive environmental studies. The environmental humanities are a multidimensional discipline encompassing such fields as anthropology, history, literary and media studies, philosophy, psychology, religion, sociology, and women’s and gender studies; however, the Routledge Environmental Humanities is particularly eager to receive book proposals that explicitly cross traditional disciplinary boundaries, bringing the full force of multiple perspectives to illuminate vexing and profound environmental topics. We favor manuscripts aimed at an international readership and written in a lively and accessible style. Our readers include scholars and students from across the span of environmental studies disciplines and thoughtful citizens and policy makers interested in the human dimensions of environmental change. Please contact the Editor, Rebecca Brennan (Rebecca.Brennan@tandf.co.uk), to submit proposals. A Cultural History of Climate Change shows that the humanities are not simply a late-arriving appendage to Earth System science, to help in the work of translation. These essays offer distinctive insights into how and why humans reason and imagine their ‘weather-worlds’ (Ingold, 2010). We learn about the interpenetration of climate and culture and are prompted to think creatively about different ways in which the idea of climate change can be conceptualised and acted upon beyond merely ‘saving the planet’. Professor Iain McCalman, University of Sydney Research Fellow in History; Director, Sydney University Environment Institute. Professor Libby Robin, Fenner School of Environment and Society, Australian National University, Canberra; Guest Professor of Environmental History, Division of History of Science, Technology and Environment, Royal Institute of Technology, Stockholm Sweden.